What does modern research say about toothpaste with neem? Does neem toothpaste really work? Chewing on a neem twig has for many centuries been the commonly preferred way to prevent gum disease and maintain healthy teeth. These rural people had never used a "real" toothbrush, didn't know Crest or Colgate, yet they had perfect teeth. A perfect natural solution. Researchers believe the tradition of using neem twigs for dental care has helped Indian villagers to avoid cavities and tooth loss although they have no access to modern dental care facilities or products. And then the other evil: plaque, tartar, gingivitis, periodontitis... You heard all about it. Gum disease is a recognized public health problem in the Western world. The widespread chronic infection of gums (gingivitis) is even believed to contribute to heart disease. But can we believe the tales from India? What does modern research say about toothpaste with neem? Does Neem Toothpaste Really Work? Researchers have studied the effects of neem on gum disease in detail. and through all this freshen the breath. Considering that the use of neem in tooth care has shown no side effects whatsoever, whereas fluoride is now highly controversial, wouldn't you want to switch? Interesting Neem Toothpaste Fact: Did You Know? The researchers used mainly neem leaf powders and extracts in their research. Interestingly the neem leaf is not even the most effective neem product for dental care purposes, it's the neem bark (hence the chewing of neem twigs). But manufacturers don't want to use bark in a toothpaste because that would make it brown. And the public isn't educated enough to accept such a product. It needs to look good, too. If you do have a serious problem with gum disease it may pay to look around for neem products containing the bark. Some toothpastes do contain bark extracts. 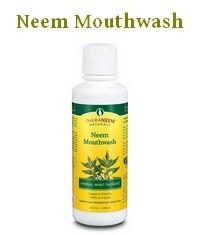 Neem mouth wash often uses neem bark as well as leaf extract. Neem tooth powder can contain dried leaf but also neem bark and neem seed. Sometimes you can also buy straight neem bark powder. (Hard to find.) Just dip your loaded toothbrush into it before brushing your teeth. In fact, if you do have a serious problem with gum disease it may pay to pay a bit more and look at something comprehensive like this. Check the ingredients list of any neem toothpaste. Not every toothpaste with neem is free of toxic ingredients. You can find some neem toothpastes that have all the conventional ingredients and just use neem as an additional ingredient. I am not saying they are bad. They are great for oral care as they do offer all the neem benefits. I am also not saying it is possible to avoid ALL artificial ingredients in toothpaste. But if your main concern is avoiding SLS, fluoride and similar chemicals, then read the label carefully. Buy neem products from a reliable, quality manufacturer. Years ago there was a neem toothpaste health scare: one brand of neem toothpaste (Neem Active Toothpaste with Calcium), at the time made by by Calcutta Chemical Co. Ltd. in India, was found to be contaminated with the toxic Diethylene Glycol (DEG). It also contained harmful levels of bacteria. Note that the company in Calcutta has long since been bought out by Henkel. It was only the older toothpaste from Calcutta that was contaminated. Neem Active Toothpaste is totally safe. But this just goes to show how important it is to only buy neem products from reliable, quality manufacturers. Examples of companies that make quality neem oral care products would be Theraneem, Neem Tree Farms or Neemaura Naturals, all of which you can find here. Herbal neem toothpaste is NOT neem oil toothpaste. There is no neem oil toothpaste. Readers keep sending in questions about using neem oil for teeth. One reader even wanted to rub neem oil on his baby son's gums on a regular basis! Neem oil is for external use only! To battle insects, pests and parasites, and for skin and hair care. Neem oil is NOT safe to take internally, ESPECIALLY for children! 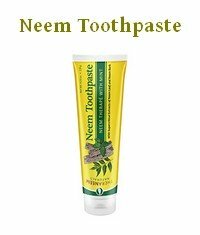 Neem toothpaste is made with neem leaf and neem bark. Don't make toothpaste or oral care products with neem oil. By the way, if you live in a tropical area, you can make your own neem toothbrush. If not, then luckily you can buy neem toothpaste. 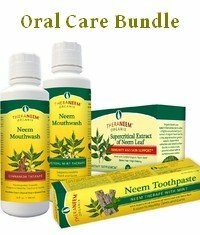 Check out a range of available quality neem products for oral care here. J Ethnopharmacol. 2004 Jan;90(1):99-103. Evaluation of antiplaque activity of Azadirachta indica leaf extract gel--a 6-week clinical study.